Greetings dear readers and friends. We have a lovely guest post today from author Jane Dunning. Jane has written several guest posts for the blog and I welcome her insights and colorful stories about Provence. 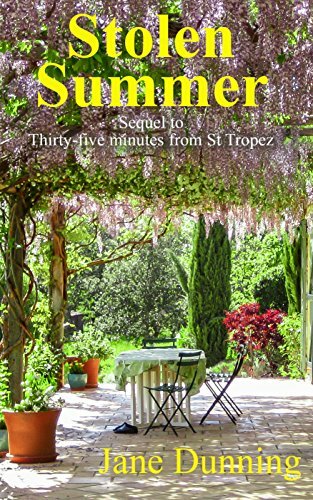 In addition, she’s written two books which are set in “our” beautiful south of France and which you can find on Amazon.com – Thirty-five Minutes from St. Tropez and its sequel, Stolen Summer. A big merci to Jane for sharing her belle Provence with us! I’ve enjoyed following Belle Provence Travels ever since I discovered Tuula’s lovely south of France blog and Facebook posts way back in around 2012. She has been brave enough to leave her home in America and make a wonderful life in Provence whereas I visit regularly rather than live in the region permanently. When I see Tuula’s posts about a trip to market on a spring Saturday, I have to confess to being rather envious. So, instead of staying in one area, my experience of Provence has been a little different as I’ve been lucky enough to stay in over twenty different places in Provence, from Orange in the north to Menton in the east, timescales from one night to four months. I’ve recently got to know the Vaucluse quite well having spent over two months there in the last year. 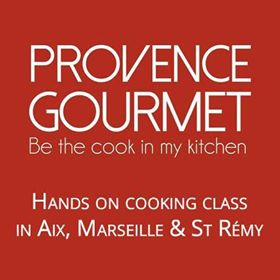 It’s the département north of Marseille and Aix-en-Provence with Avignon as its capital city. I’d stayed before, when I rented a cottage near Cavaillon and I have vivid memories of driving through tiny lanes of peaceful vineyards before stopping to explore a tumble-down village or having lunch with a wonderful view of Mont Ventoux, of Tour de France fame, in the distance. My recent visits have been in the winter and early spring when everywhere is very quiet, although there is a buzz of excitement around Christmas and New Year when the markets are busy and full of gourmet delicacies. Even though it’s winter, the markets continue, so I plan my visits to towns and villages on market day so that there are more people around. It’s often warm enough to dine outside for lunch. I particularly like Au Chineur, in L’Isle-sur-la-Sorgue on a sunny winter’s day – simple food, busy with a friendly welcome. If I remember rightly, Tuula liked it, too! Probably the most famous village in the Luberon, one of the areas of the Vaucluse and named after the Grand Luberon and Petit Luberon hills, is Gordes. It’s a village of pale golden stone that tumbles down the hillside. There are great photo opportunities as you drive in – the local council has even provided short-term parking spaces to allow visitors time to stop to take a few shots of the stupendous view of the village. There are several restaurants and cafés, and steep, tiny streets to explore. Again, it’s better to visit on market day as it brings the village alive although in summer, another day might be advisable to avoid the crowds. Abbaye Notre-Dame de Sénanque near Gordes at lavender time. Another favourite in the Luberon is Roussillon, famed for its ochre-coloured stone and houses. One of my favourite buildings is the mairie, town hall – it must be one of the prettiest in Provence. If you climb right to the top of the village, past the church, there are great views of the ochre-coloured hills, the valley and Mont Ventoux – it’s difficult to get away from this white-topped mountain in the Vaucluse! There are some wonderful holiday rentals in the Luberon. 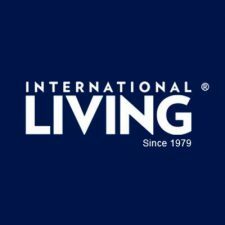 I would suggest checking out http://www.theluberon.com which not only has houses of all sizes to rent but also great descriptions and pictures of the villages and towns of the area. For further information about the area, try www.beyond.fr – a very useful website for the whole of Provence. If you’re interested in exploring the whole area, I would suggest Goult, Roussillon, Joucas or Gordes as being good choices to find somewhere to stay. If you like the idea of a hotel or bed and breakfast, you could perhaps stay around Apt and then move nearer to Avignon to save too much travel but places aren’t too far apart and the scenery is fabulous so it’s not exactly a hardship. My two novels are set nearer to Tuula’s home town, although slightly further east, near St Tropez. 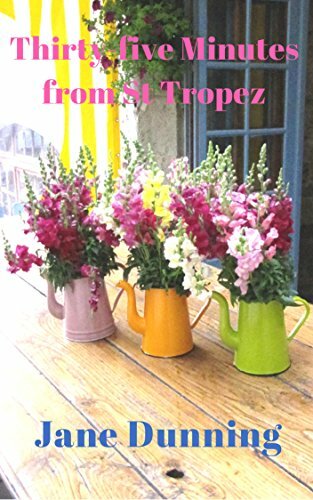 There are also chapters set in Antibes/Juan-les-Pins and Monaco along with Aix-en-Provence, Menton, Cap Ferrat and Vence to name but a few other beautiful locations. Thanks so much to Tuula for inviting me to guest post on her blog. My colourful Facebook Page can be found at www.facebook.com/JaneDunningAuthor – you’ll find lots of great photos of Provence, the rest of France and Italy. Thanks so much for allowing me this guest post on your wonderful Provençal blog… It’s the first I’ve written about the Luberon – now I finally know it a lot better! A pleasure Jane! 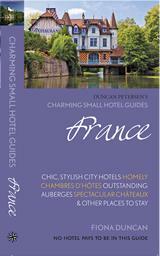 A big thank you to you for your wonderful descriptions of the Luberon and lovely photos. So glad that we can share our mutual admiration for this beautiful corner of the world! Your words and pictures make me want to fly away to France right this second. 🙂 What beautiful places you have visited.